The NASCAR Xfinity Series race at Phoenix in November 2017. While most of us don’t enjoy daylight saving time or the sadness that comes with it, not practicing it when everyone else does sounds just as bad. 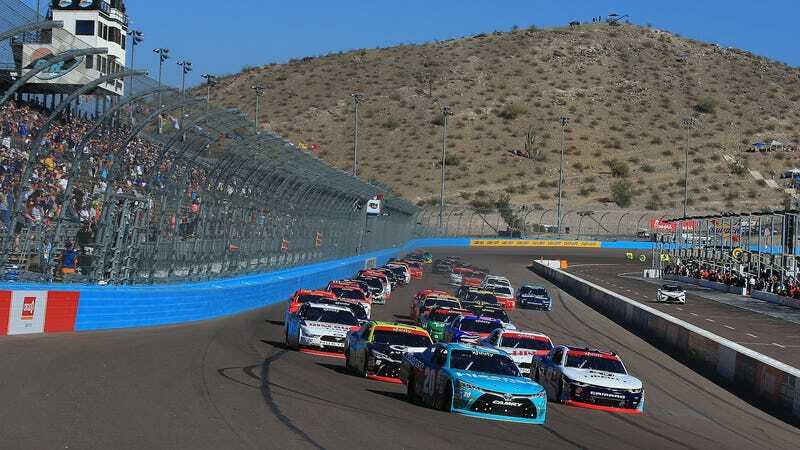 Most of Arizona doesn’t honor the changing of clocks, and that means this weekend’s NASCAR races will happen in more than one time zone—at the same race track. On a map of the different zones of daylight saving time, almost all of Arizona will be its own color because the state doesn’t want to deal with that “spring forward, fall back” stuff. Good for Arizona, since none of us really like leaving work at 5 p.m. in the winter to have the sun go down 10 minutes after anyway. But ignoring daylight saving makes its own headaches: Arizona hops time zones a couple of times a year to avoid it, and it’ll make a hop on NASCAR weekend at Phoenix International Raceway this year. That means, according to ESPN’s Bob Pockrass, that Friday practices and the Saturday Xfinity Series race will happen in Mountain Time locally, while the Monster Energy NASCAR Cup Series race schedule will be on Pacific Time. The clocks won’t change, but the zones will. The best time to watch a Phoenix race anyway, with its current layout: at night. The Subway Fresh Fit 500 in 2007. All of that’s probably about as normal to people who live in Arizona as daylight saving time is to the rest of us, but people who travel in for the race could be in for a real doozy in trying to figure out when to get to the race track on Sunday. Not all of our choices can be as great as the choice to ignore daylight saving time, evidently.